HAMMOND Electronics has added an additional three sizes to its recently introduced 1455 family of extruded aluminium instrument cases. 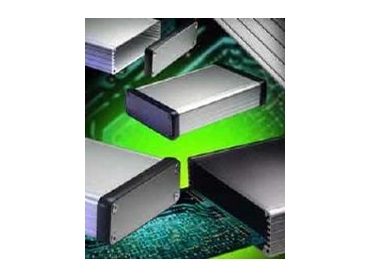 Designed to house PCBs mounted horizontally into internal slots in the body of the case, they are also suitable as an enclosure for any small electronic, electrical or pneumatic instrument. The new sizes are the 1455J160, 160 x 78 x 27mm, the 1455L160, 160 x 103 x 30.5mm and the 1455L220, 220 x 103 x 30.5mm. The two larger sizes accept standard or extended depth Eurocard. The cases are available with either two aluminium end panels and optional ABS plastic bezels or with two solid, easy to machine black ABS plastic end panels complete with integral bezel. The body of the enclosure is in either clear or black anodised finish and is supplied complete with fixings and self-adhesive rubber feet. Optional aluminium flange brackets, replacing the standard end panels, enabling the unit to be mounted directly to a shelf or wall, are also available.